Local sustainability consulting firm the Brendle Group recently installed two new Level 2 electric vehicle (EV) charging stations after joining the Northern Colorado Workplace Charging Challenge at our February launch event. “As EVs and EV charging become more practical and cost effective, we felt it important to understand technically and operationally how workplace charging fits into overall energy management solutions both for ourselves, and for our customers,” said Brendle Group COO, Dan Epstein. Brendle Group strives to be a leader of innovative sustainable practices and focuses their organization on “inspiring and empowering organizations to make thoughtful choices about energy and the resources they use,” says Katie Kershman, Marketing and Business Development Coordinator. The workplace charging station fits perfectly within their vision, and excitement around the station has spread throughout the company. The station is available not only to Brendle Group employees, but also to the public. “Brendle Group is both a thought leader and application leader in sustainability engineering and planning best practices,” Epstein added. 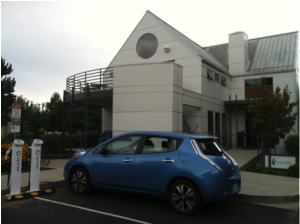 For this reason, Brendle Group felt it important to have first-hand experience with EVs and charging to better understand how the technology can and should operate in the workplace, realize the impacts on electrical usage and building energy management, and to help figure out ways to drive usage and carbon reductions. Additionally, Brendle Group felt charging stations would help drive employees to reduce their transportation carbon footprint and work as an educational tool for the public. 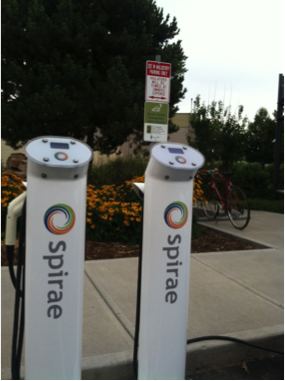 The road to workplace charging was smooth for Brendle Group. 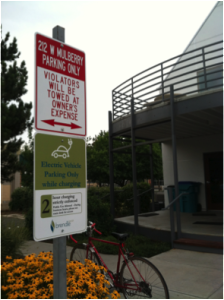 The firm applied for a grant through the Colorado Energy office and because of the timing of the grant, the total timeline for the installation of the charging stations was from March to June of 2015. Epstein felt the most challenging area of the process was finding accurate and consistent information on the different technologies and providers. Because it was the first time Brendle Group had worked on such a project, it was difficult to identify all the “right” questions to ask of suppliers. Epstein recommends workplaces considering workplace charging to hold or attend an event where all the providers are present to explain their technologies in depth, like the DENC Workplace Charging Workshop held on September 15 at Colorado State University. One of Brendle Group’s initiatives is to create a showcase for sustainability, “Everyone at the office contributes to our internal sustainability efforts in some way,” says Kershman. A few people in the office have now considered buying an EV since the charging stations were installed, and the employees view the charging stations as an employee perk. Many are excited to see their use now, and in the future as EV technology advances. Additionally, Brendle Group is investigating the purchase of EVs as fleet vehicles, which be available for employee use. If you would like learn how you can implement workplace charging in your business, and the advantages of doing so, visit the workplace charging portion of our website and, as always, feel free to contact Annie at afreyschlag@electrificationcoalition.org for general questions. To learn more about Brendle Group, click here.